It’s crazy how much you learn about a person when you work with them. One fun fact I learned about my senior from last year was that she loves Milky Way candy bars. Today is her birthday, and I wanted to make her a fabulous birthday cake. Using the chocolate-caramel-nougat goodness of Milky Ways as an inspiration, I decided to make her this Milky Way Chocolate Cake. Preheat oven to 350 degrees F. Grease four 9-inch round cake pans, and line/grease the bottoms with rounds of parchment paper. Begin by making the chocolate cake batter. In a very large bowl, sift together the flour, sugar, cocoa powder, baking soda, baking powder and salt. In a medium bowl, whisk together the eggs, buttermilk, coffee, oil and vanilla. Add the wet ingredients to the dry ingredients and mix for 2 minutes on medium speed. Scrape the sides and bottom of the bowl and mix for an additional 20 seconds (the batter will be very thin). For the Nougat Filling, melt the butter in a medium saucepan over medium heat. Add the sugar and evaporated milk, stirring until dissolved, and bring to a boil. Reduce the heat to low and cook for 5 minutes, stirring occasionally. Remove the pan from heat and add the marshmallow fluff, and vanilla extract, stirring until completely smooth. Let the nougat mixture cool to room temperature before using it in the cake. You can do this leaving it at room temperature or you can pop it into the refrigerator to speed up the process. Be sure to give a stir occasionally as it cools. While the cakes cool, make the frosting. Beat together the butter and cream cheese on medium-high speed for 5 minutes. Pour in the salted caramel and beat until combined. Reduce the speed to medium-low and slowly add the powdered sugar, a little at a time, until it has all been incorporated. Increase the speed to medium-high and beat for an additional two to three minutes, until light and fluffy. For the cake assembly, place one cake layer on a serving plate. 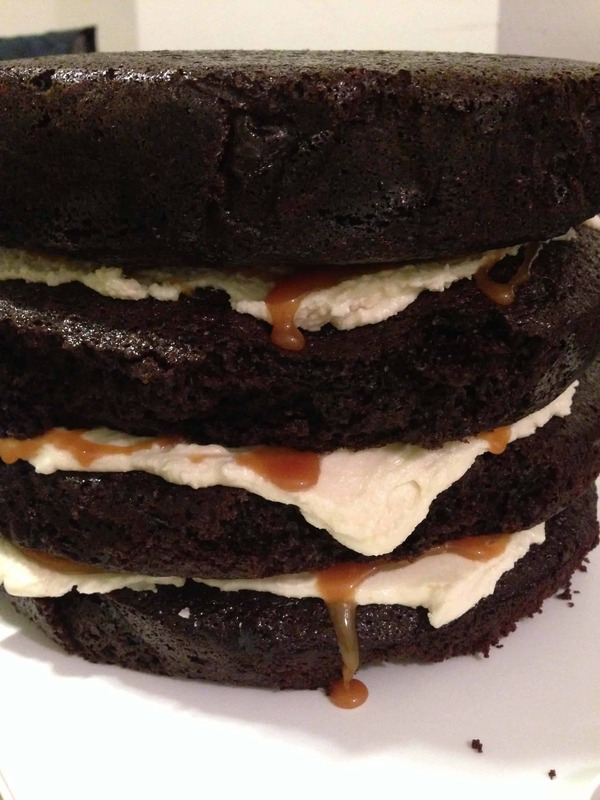 Cover with half of the nougat filling and then spread a couple spoonfuls of the salted caramel sauce over top to evenly cover the nougat filling. 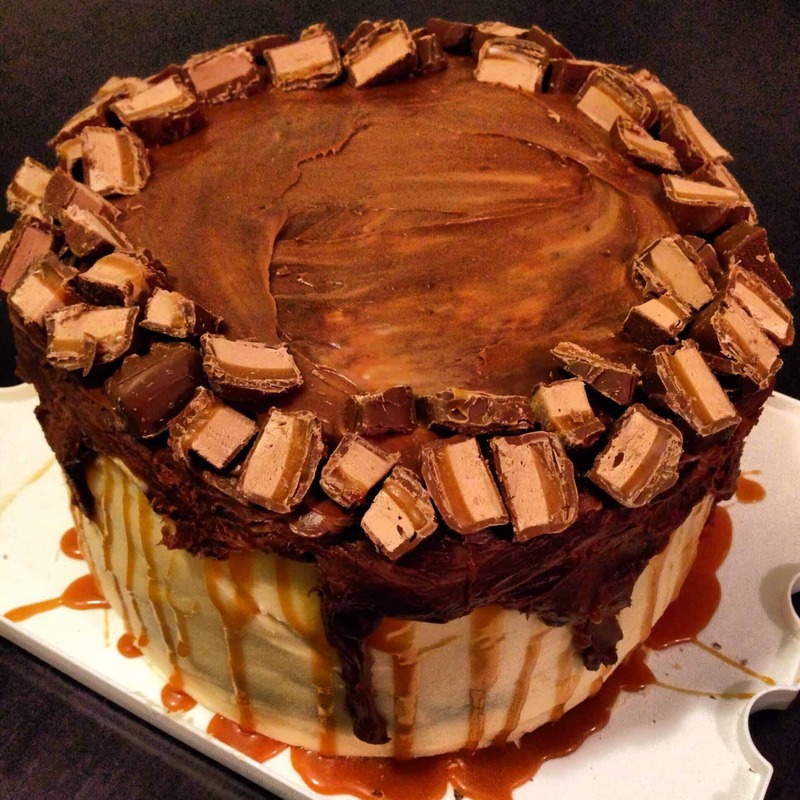 Top with a second cake layer and cover with the remaining nougat filling and top with caramel sauce. 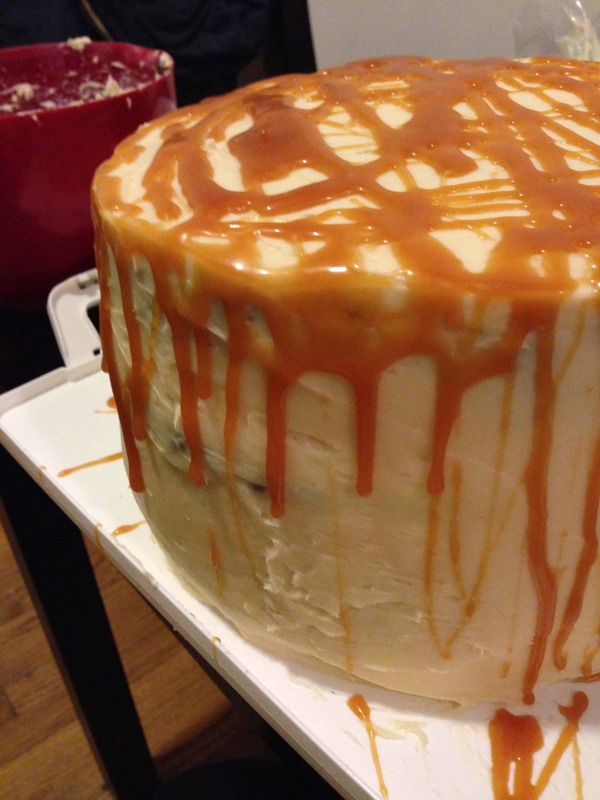 Frost the cake with the salted caramel frosting, finishing it as smoothly as possible. Refrigerate the cake for at least 30 minutes, until the frosting is set. The garnish is the final step. Slowly pour the chocolate ganache into the center of the cake, letting it push itself outward and flow over the sides of the cake. Refrigerate the cake for at least 30 minutes, giving the ganache a chance to set up. 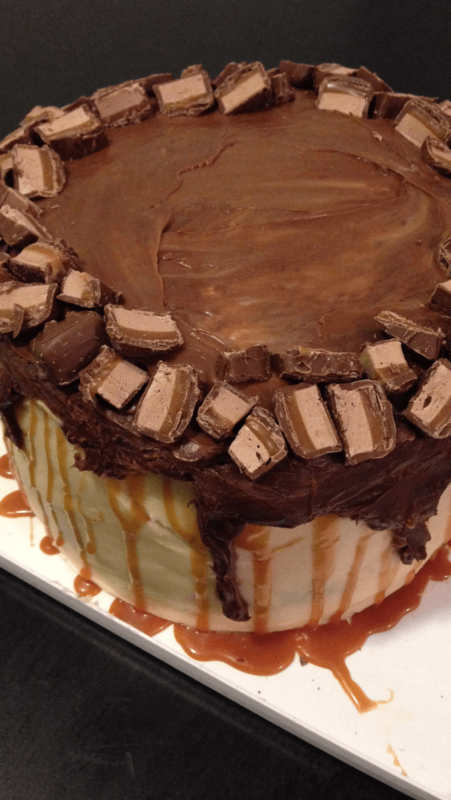 Drizzle some additional salted caramel sauce over the top and side of the cake, and top with chopped milky way bars. Keep the cake refrigerated, removing it from the refrigerator about 20 minutes prior to serving. For clean slices, run the cutting knife under hot water (and dry) just before cutting.